A jury convicted a woman on Wednesday who was arrested during a congressional hearing in January after laughing at the claim that now-Attorney General Jeff Sessions had a record of treating Americans equally. 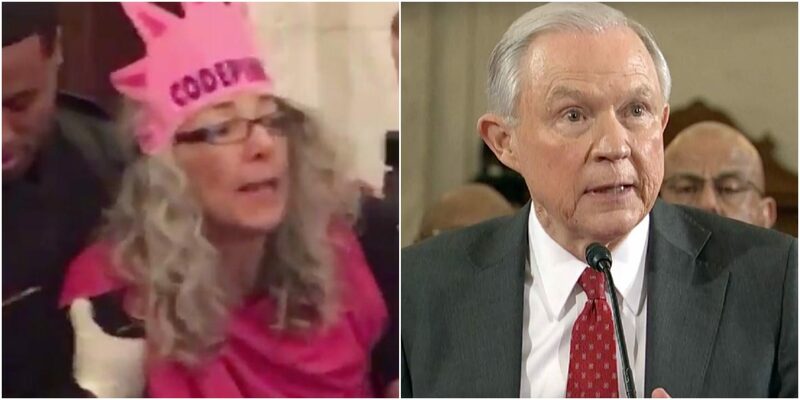 Desiree Fairooz, an activist associated with the organization Code Pink, was found guilty on two counts: one for engaging in “disorderly or disruptive conduct” with the intent to disrupt congressional proceedings and a separate count for parading, demonstrating or picketing. Several jurors who spoke with HuffPost after the verdict emphasized that they were focused on Fairooz’s actions after a rookie Capitol Police officer approached Fairooz when she laughed at Sen. Richard Shelby’s (R-Ala.) claim that Sessions had a clear, well-documented and “extensive record of treating all Americans equally under the law.” A group of jurors spoke to HuffPost on the condition of anonymity. “She did not get convicted for laughing. It was her actions as she was being asked to leave,” the jury foreperson said. Several of the jurors indicated they disagreed with the decision of Capitol Police Officer Katherine Coronado to take her into custody because of the laugh. “There’s not a lot of wiggle room,” said the jury foreperson. It seems the jurors didn’t want to convict this person but felt they had to by how the law was worded. It’s clear that these jurors didn’t know about Jury Nullification. Which is the Juror’s right to not convict a person based off conscious not law. You’re basically saying that maybe the person did break the law but they don’t deserve to be punished in this form. What’s more sad is that the state has these catch all charges that are nearly impossible to beat. They even extend to laughing at a public official who then can have you charged with disorderly conduct…. for laughing. If you laugh at anyone outside of a person in power the worst that could happen to you is that you’d get in a fist fight. With the state it could cost you thousands of dollars and possible time in jail. Badges Don’t Grant Extra Rights is what we say here at CopBlock.org, but working for the Justice Department (or any courthouse) doesn’t either. What are your thoughts? Was this trial and possible pending jail sentence for this woman worth the resources? Are you happy your tax dollars go to keep people who laugh at public officials off the streets?